The BC543 is a self-contained, high-output cardioid subwoofer system for both permanent and portable ground-stacked applications. It is designed to offer a high output, tight and accurate sub-bass response, for low-frequency extension of any Alcons pro-ribbon system. By means of a front and rear located woofer configuration, in combination with DDP™ processing, the system offers selectable cardioid low-frequency pattern control and excellent rear rejection (up to 18dB), without the need for additional cabinets. 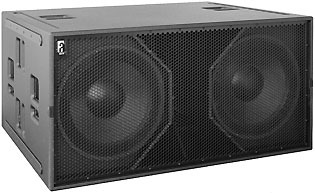 On the front side, two state-of-the-art 18” longexcursion woofers with 5.3-in. voice-coil with vented triple-spider frame, Neodymium motor structure and all-carbon-fibre cone and dust cap are mounted in a front-loaded configuration, with centrally-located X-Venting™; This port takes more than 25% of the baffle surface and is designed to maximise the system’s breathing capacity, increasing overall output while minimising port-compression. The extreme excursion capabilities of the 18” design, extends the output by 3.5dB compared to traditional 18” designs. On the rear side, a single state-of-the-art 18” longexcursion woofer with 5.3-in. voice-coil, Neodymium motor structure and all-carbon-fibre cone and dustcap is mounted in a front-loaded configuration, with Flank-Venting™ port; This folded port design enables optimal reflex-breathing, under minimal baffle dimensions. The combination of complex internal panel lay-out and extensive bracing brings a rigid structure with a high enclosure stiffness from a relatively low-weight package. It is finished in Durotect™ scratch-resistant coating and is fitted with 12 handles for easy logistics (road-version). The BC543 is powered and controlled by the ALC amplified loudspeaker controller; Through the DDP™ (Digital Drive Processor), the ALC offers BC543-specific drive processing with response optimisation, dedicated power and excursion protection, and hybrid filtering. The preset library contains cardioid settings for “omni”, “cardioid” and “hyper-cardioid” patterns for maximum rear-/side-ward attenuation. Through the SIS™ (Signal Integrity Sensing) circuit, the cable-length and connector resistance between the BC543 and ALC is completely compensated (damping factor >10.000), for further increased accuracy and controlled cone-travel, resulting in a tighter sub and bass response. The BC543 is available in standard version, or installation version. The BC543i (“install”) comes without handles, castor wheels and cover.